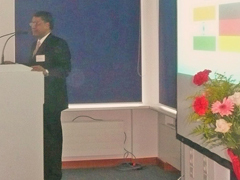 Welcome to the 3rd Hanseatic India Colloquium The Honourable Consul General of India in Hamburg, Dr. Vinod Kumar, presenting the opening speech. 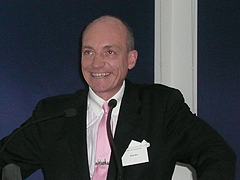 Mr. Bernd Reinert, State Secretary, Ministry of Science & Research, Free and Hanseatic City of Hamburg, Germany, welcomes the delegates. 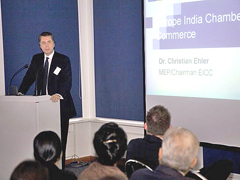 Dr. Christian Ehler, Chairman, Europe India Chamber of Commerce, Member of European Parliament, Brussels, Belgium, spoke about the role of the Europe India Chamber of Commerce in promoting Indo-European Business. 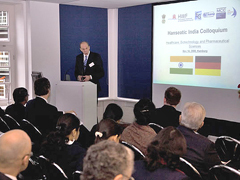 Dr. Tomas Kahn, Head, Expert Team Life Sciences, Deutsche Bank AG, Frankfurt, gave an insight into the role of the financial sector in enabling bilateral business activities in healthcare. 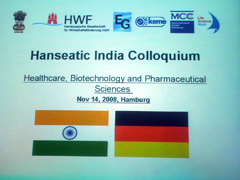 Mr. Guido Krupp, CEO & President, AmpTec GmbH, Hamburg, chaired the 1st business session on Pharmaceutical Research & Development. 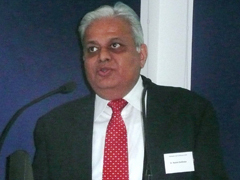 Dr. Rashmi Barbhaiya, CEO & Managing Director, Advinus Therapeutics Pvt. 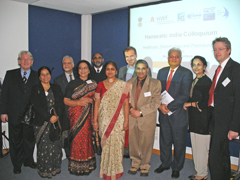 Ltd., Bangalore, impressed us with the improvements in Research & Development in Indian Pharmaceutical Industry. 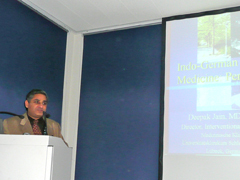 Mr Pankaj Patel gave a special presentation on behalf of a delegation from Gujarat, India, “Gujarat: The Growth Engine of India”. 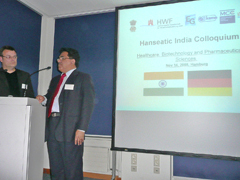 Mr. Hans-Ulrich Baldes, Chairman, Executive Board, WWWS World Wide Water Systems AG, Hamburg, gave a Special Lecture on “Water treatment and water supply by reverse osmosis system and ion exchange”. 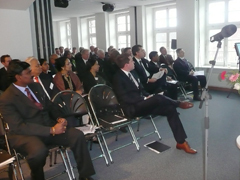 Mr. Rolf Gunther, Chairing the 2nd business session on Bioinformatics & Biotechnology, and Dr. Amal K Mukhopadhyay, Colloquium organizer, are listening with rapt attention. 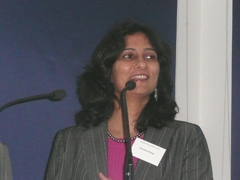 Ms. Deepanwita Chattopadhyay, CEO, ICICI Knowledge Park, Hyderabad, spoke about life science park as cluster development tools and used the model of the ICICI Knowledge Park in Hyderabad, India. 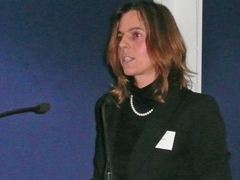 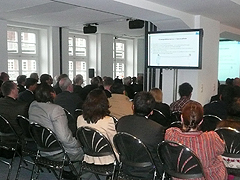 Dr. Kathrin Adlkofer, CEO Norgenta, Hamburg, provided the contrast speaking about North German cluster of life sciences. 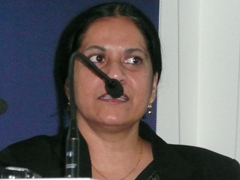 Ms. Anuradha Acharya, Founder & CEO, Ocimum Biosolutions, Hyderabad, highlighted the acquisition spree of Indian companies, particularly her own, talking about going global with Genomics. 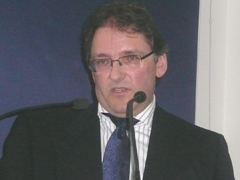 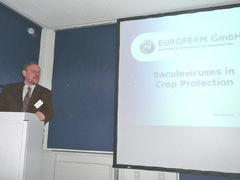 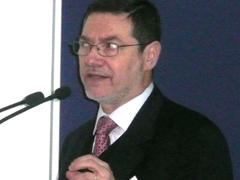 Dr. Peter Fischer, CEO, Euroferm, Erlangen, described an innovative approach in agro-biotechnology for crop protection. 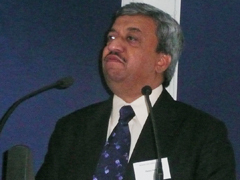 Mr. George Varghese, Senior Vice President, Diagnostics, Piramal Health Care, Mumbai, spoke about the current status and future of in vitro diagnostics in India. 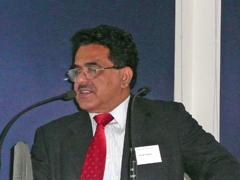 Prof. Dr. Oliver Rentzsch, CEO, MEDREGIO, Lübeck, chaired the 3rd business session on Diagnostics & Clinic, during the question & answer session with speaker Mr. George Varghese. 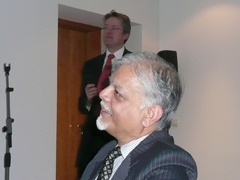 Dr. Deepak Jain, Consultant Interventional Cardiologist and Co-Director, Medical University of Schleswig-Holstein, Lübeck, gave a very lively presentation describing his innovative patient-care technology in cardiovascular complications. 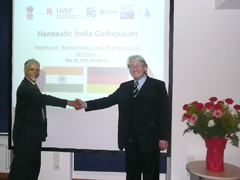 developed through Indo-German research cooperation in medicine. 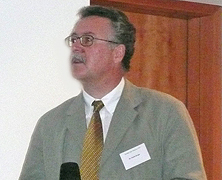 Mr. Stefan Matz, Director, International Affairs, HWF, Hamburg, closed the Colloquium with an overview of the economic scenario in Northern Germany and Hamburg and the services provided by HWF. 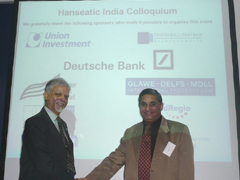 Screens were put up for the audience Co organizers of the Colloquium, Dr. Amal K. Mukhopadhyay and Mr. Dieter Grützmacher. 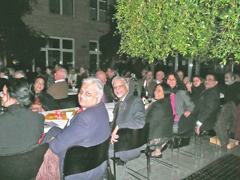 The final highlight of India Week Hamburg, “Diwali - Festival of Lights” took place and invitees enjoyed the program. 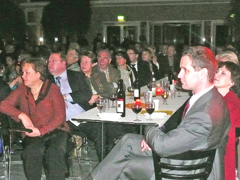 Many speakers sat together and enjoyed the Diwali program. 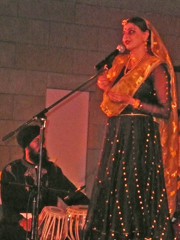 Classical Indian dance Kathak was performed along with live music. 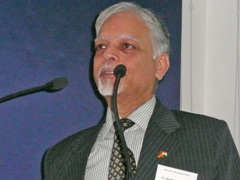 Finally the evening ended with Bollywood extravaganza.